The definitive collection of imported delicacies is presented in our tailored isothermic cooler. It's the perfect gift to leave a lasting impression on a birthday, anniversary, or for clients and colleagues. 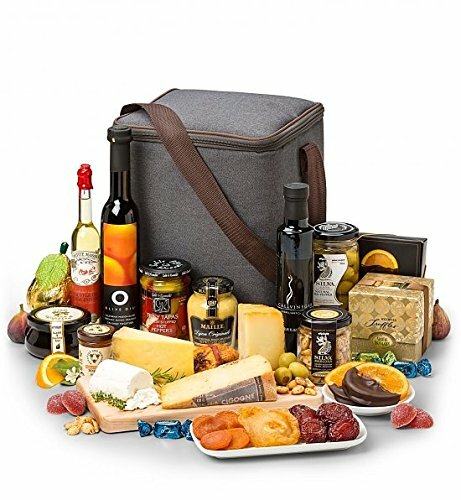 Included in this Gift: French Artisan Cheeses, Monte Chevre Truffle Goat Cheese. Stuffed Olives, Marcona Almonds, Barrel Aged Balsamic. Blood Orange Olive Oil, White Truffle Oil, Glazed Roasted Figs. A tailored isothermic cooler bears the ultimate in artisan cheeses, alongside premium gourmet pairings, specialty oils and barrel-aged balsamic. French Artisan Cheeses: Cantelet, Petit Basque, Elderflower. Monte Chevre Truffle Goat Cheese, Barrel Aged Balsamic.